The Cursedglow Dragon is an agitator and is used to being a walking target for danger. This cocky dragon has a high threshold for pain, is always looking over his shoulder, doesn’t shy away from a battle, and has an eye for every occasion. Cursedglow is not Currently Breedable. Sorry. Cursedglow is a Legend primary element dragon and so can only be critical hit by other Legends. Avoid using Physical based attacks against Cursedglow as they will have a weak effect. 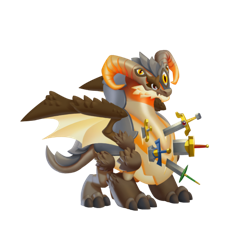 To beat Cursedglow use high category dragons with strong attacks, higher level, and/or lots of stars!